Ram miesten vasuri raudat teräs varsi, reg. 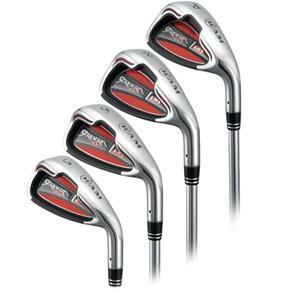 The Ram Serbera Irons are the pinnacle of forgiveness. Ideal for mid-handicappers, these advanced irons use multiple materials in the clubhead to produce greater control, high launch and incredible distance. The centre of gravity is very low, and while the effects of off-centre hits are reduced by the design of the club face, feel is not sacrificed. All sets are 4 - SW irons, with Golf Pride grips. Tuotteen lisäyspäivä: keskiviikkona 14 heinäkuuta 2010.